I grew up in a place where people didn’t hire others to mow their lawns or cook their food or take care of their kids. Having servants was the history of the Guilded Age or the English aristocracy. Maybe some Americans had servants but only the oddball rich like the Howells on Gilligan’s Island. But trends in the economy are making me less comfortable that America transcends class in any way. Just look at the latest job projections (below) by the Bureau of Labor Statistics. 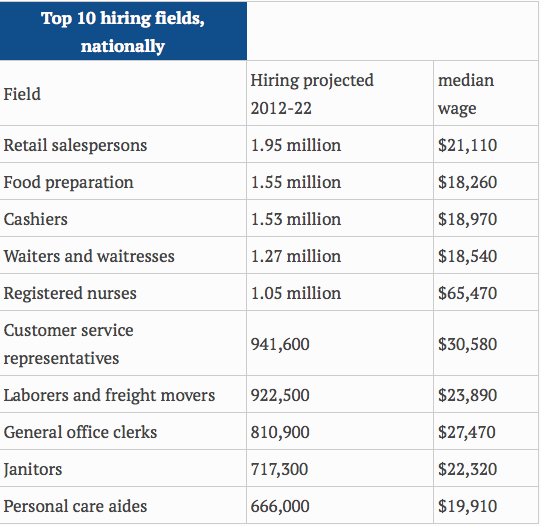 Among the top ten hiring professions, only nursing pays a decent wage. The others are a collection of low-paying service jobs that you don’t aspire to but settle for. We’re turning into a nation of wealthy people and an underclass that sees to their daily needs. The other thing that strikes me about the list is that none of the jobs seem to require a college education. Does it make sense any more to save for your kids’ college tuition payments? College may have once guaranteed entrance into the middle class, but now college grads are competing for a dwindling number of decent paying jobs because the rest of those jobs have been outsourced. We’ve been thrown into a global economy with people who have the same training and education and are happy to make half as much. Yesterday I took my kids to have dinner at Burger Lounge, one of those burger joints that pretend to be high-end: Grass-fed beef, choice of micro-brews, you know what I mean. And I watched the young people who were waiting tables and running the cash registers. They were good-looking kids and they seemed high-spirited. But for them… was this it? Not just a stepping-stone job to something better, but one in a series of jobs that will pay the same and require no more in the way of skills? And if the latter is the case, who’s fault is it? Our stories of the past make heroes out of people named Roosevelt who busted trusts and turned America into a place where the rich weren’t all that rich. Lyndon Johnson talked about eliminating poverty even though the good book said the poor would always be with us. But America has changed and we need to a write a new story. Life is a gift and material wealth isn’t everything. But it’s something, and what do we do when it’s something that looks out of reach for my kids and grandkids. This entry was posted on April 4, 2014 at 3:27 am and is filed under Uncategorized. You can subscribe via RSS 2.0 feed to this post's comments. You can comment below, or link to this permanent URL from your own site.